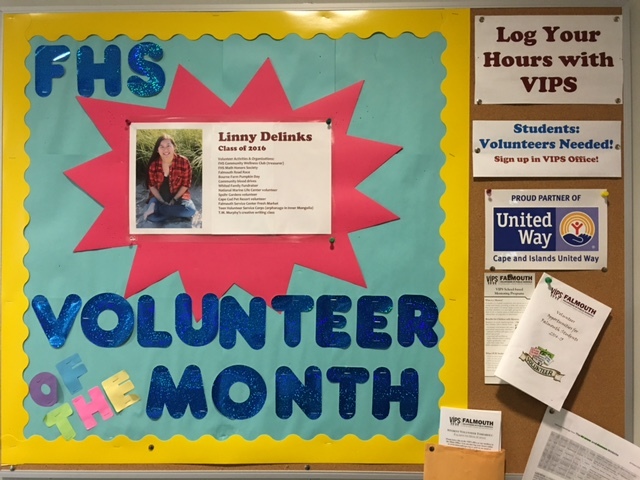 For several years, Falmouth VIPS has featured a Student Volunteer of the Month at Falmouth High School. This program was started with a grant from the Falmouth Education Foundation to acknowledge and celebrate students who share their time with community and school causes. The only requirement is that students must log their hours with VIPS. Their is no minimum number of hours, but past recipients have a variety of causes and activities on their list. Kayla, FHS Class of 2019, is involved with sports, academic, and community activities. At FHS, Kayla is a member of the National Honor Society, Math Honor Society, and Falmouth Field Hockey. Kayla has been a member of the Falmouth Dance Academy's Senior Competition Team for 10 years. In the community, Kayla serves as a teaching assistant at Falmouth Dance Academy, numerous Falmouth Field Hockey events and fundraisers, serves as a volunteer tutor, and volunteers at St. Anthony's Bible School. Colleen is a member of the FHS Class of 2019. She is a member of the National Honor Society, the National Art Honor Society, and the FHS Varsity Volleyball and Golf teams. Colleen serves as a high school peer mentor. Outside of school, Colleen is a member of the Falmouth Figure Skating Club (FFSC) and Junior Olympics Volleyball. Colleen's volunteer activities include coaching for the FFSC's Learn to Skate program and the Lawrence School volleyball team. She also volunteers for the Falmouth Road Race, Teaticket Field Day, and the VIPS Feast of Falmouth event. Adam, member of the FHS Class of 2020, is a member of the FHS Marching Band (playing baritone) and the FHS Symphony Band (playing euphonium). Adam helped the Marching Band earn a gold medal rating in the 2018 New England Scholastic Marching Band competition. Adam is also involved as a volunteer with Falmouth Community Television, the Falmouth Road Race, St. Elizabeth Seton, and Seven Stars Academy of Martial Arts where he serves as a teaching assistant for karate.